Khalsa, S., M. Dyurgerov, T. Khromova, B. Raup, R. Barry. (2004). "Space-based mapping of glacier changes using ASTER and GIS tools." IEEE Transactions on Geoscience and Remote Sensing 42(10): 2177-2183. -More than 100 million people live at n elevation within 1m of sea level. -IPCC says will sea level will rise .5m during the 21st century, much of this will come from glaciers. Latest estimate is 27%. -Ice and firn have lower albedo (50% or less) compared to seasonal snow (60 to 90%) so the SLA may be determined remotely. -If measured at the end of the season the SLA is approximately coincident with the ELA, if before it may be lower. -The distribution of a glaciers surface area over elevation is its hypsography. -The annual mass balance of a glacier summed over all areas of the glacier over 1 year is a linear function of AAR. 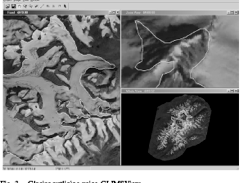 -They digitized glacier outlines by hand based on an ASTER image using the free GLIMS software. -They made an area-by-elevation histogram (the hypsography) for each glacier by counting the number of pixels in 50m elevation bands having a particular glacier identification. – This could be a GIS trick I could use. -The study then uses several equations to estimate the Mass balance of glaciers using their ELA and field measurements were used to determine mass balance as a function of accumulation area ratio. -They say that their accuracy for glacier boundaries was within 2 aster pixels (30m) but they don’t talk about debris covered ice which ASTER can’t see through… I find it strange they don’t mention such a crucial possible error in such a paper where this is well known to be a problem. -They found that the process of volume change with elevation is not linear, but varies according to glacier hypsography. Ultimately, this paper uses several equations to determine Mass Balance and ELA, AAR relationships but I think at least some of the input variables were field observations and it wasn’t too clear how they found the ELA/AAR from the ASTER imagery… perhaps this is something I could look back at if I begin to use ASTER imagery. ELA methods,” J. Glaciol., vol. 38, no. 128, pp. 101–104, 1992. Columbia glaciers from 1976 to 1984: Methods and results,” Ann. Glaciol., vol. 9, pp. 189–194, 1987. Proc. IGARSS, Toulouse, France, July 21–25, 2003. The hypsometry plot would be very useful. Not sure why they don't mention debris-covered ice. It is a big problem for glacier mapping! I'll see Siri Jhodha Singh Khalsa at the AGU meeting in a couple of weeks and will talk with him about their work in this area.